Translated, Puerto Rico means “rich port”. Before hurricane Maria hit the island on September 20th 2017 and destroyed it more or less completely, about 3.5 million people lived in the uncorporated territory of the USA. In the weeks after the storm, approximately 500-700,000 inhabitants emigrated (mostly to the United States of America). Furthermore, about 1000 people lost their lives through direct or indirect consequences of the natural disaster. The resulting property damage is about $95 billion and FEMA (the US Civil Protection) expects a period of one to two years to rebuild the island completely. Puerto Rico has been bankrupt since the hurricane and the USA not helping does not make the situation any better. It is a bitter pill to devote a street in your capital to the statues of the presidents of the United States, but in the end, they are so indifferent, it borders to inhumanity. Well, America first. Incidentally, with lots of US hospital supplies being made in Puerto Rico, US hospitals are struggling with dwindling IV bag resources, as the production plants on the island don´t have electricity yet…Karma? Tes and I arrived four months after the incident and stayed for nearly two. As in Mompiche, we had found a Housesit, again. This time, we were sitting three small dogs instead of cats. After arriving in San Juan, we got a rental car and visited the old town. Only then, we drove to Ponce – our home for the next few weeks. As soon as we had left the airport, we cought sight of the first storm damage: broken power poles with cables hanging down, most of the traffic signs were spread in the prairie, traffic lights had either disappeared or been destroyed and there were a lot of trees laying along the roadside. But: In view of the short time after the natural disaster, the island looked much better than expected. Almost all roads were cleared, you could buy all food and electricity and water were functioning on about 70% of the island (as of the end of February 18). The easiest way to recognize the disaster were clearly the cars of the locals: You could find car body damage, broken lights and bent bodies that just can´t come from a traffic accident. This way, you can easily conclude on the income of the driver. Richer locals drive new cars, while poor people often lack the money to repair their own vehicle even a little. Due to the destroyed traffic lights, especially in San Juan, the pure chaos prevailed. This is solved according to a simple rule: first come, first drive. Difficult, when the roads are so crowded, that nobody can drive at all. Therefore, half a mile in the city took 45 min. The capital of the Caribbean island is home to about 400,000 inhabitants and the tourist as well as economic and cultural center. The first settlements date back to the beginning of the 16th century and ran under the name “Caparra” first. Only later the settlement was renamed “Puerto Rico”. Through history, there are numerous attractions to explore. The most popular is probably the old town, that thrills with countless colorful houses, narrow streets and lots of flair. 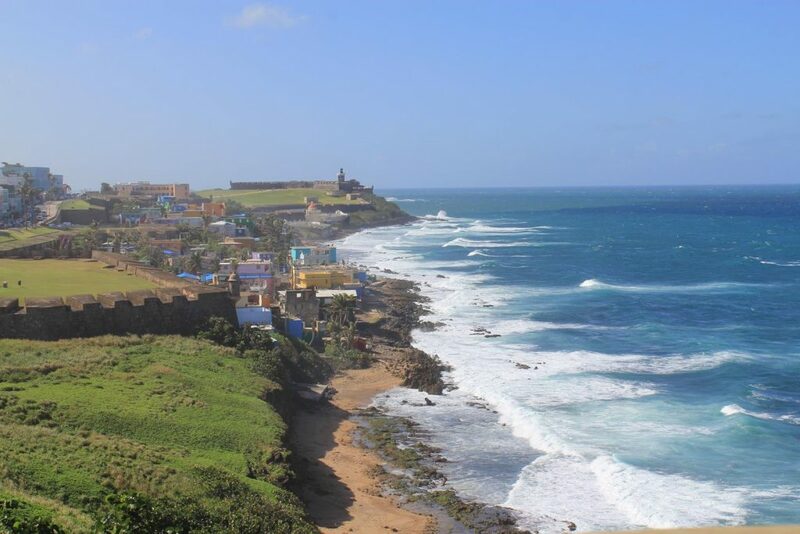 Old San Juan is also home to two fortresses (El Morro and La Fortaleza) that offer fabulous views of the sea and the promenade “Paseo de la Princesa”. Not far away is the “Isla Verde”, which is internationally known for its beautiful beach. In the “Puerta de San Juan” you can feed pigeons and get a nice view over the cruise ship port. While strolling through the city, you discover dozens of statues, fountains, art in all shapes and tons of historic buildings. In addition, the city has a myriad of museums (art, history, wildlife, etc), which I do not care for at 30 degrees Celsius outside temperature (86 Fahrenheit) – we did not visit one. The public transport network on the island is little developed until not available. There are no buses between the cities, no tram and there is only a subway in San Juan. This is the first rail link (17 km long) in the Caribbean – if it works after the hurricane – no idea. Incidentally, Puerto Rico is known for its thriving street art scene. Pictures are available in one of my Instagram posts. The cities on the island are all very similar and have a strong American influence. The “City of the Lions” makes no difference and impresses with juxtaposed fast food chains, Walmart’s and Walgreens as well as Drive-Thru bank counters and pharmacies. Shopping is a big thing and underlines the American influence in addition. Everything is about buying and eating, you are showered with advertisements and encounter an above average number of overweight people. The city does not necessarily offer much in terms of sights. A visit to the city center and especially the “Plaza Las Delicias”, which is located next to the “Ponce Cathedral” and the “Parque de Bombas” (Fire Museum), is recommended. The building is considered the most recognizable site on the island and was opened in 1882. Not far from the museum, there is an obelisk to commemorate seven firefighters. In 1899, they had denied the command of American forces and extinguished a fire that had broken out in the black powder warehouse of the soldiers. This just barely eluded the city of a disaster, that would have destroyed the economy of the entire island – after all, back then Ponce was the banking and agricultural center. As a thank you, the firefighters were provided houses that were also painted in the colors of the city (red / black) and still stand today. Other popular destinations in Ponce are the “Paseo tablado la Guancha” – the beach promenade, which transforms to a party mile in the evening and the Cruceta del Vigía – an oversized cross from which you get a wonderful view over the city. To visit the sights, a rental car is mandatory – as I said – there is no public transport. Otherwise, you can find beautiful sandy beaches all over the island and picking a favorite is extremely difficult. Next to the aforementioned Isla Verde, the beaches in Rincon on the west coast are the most popular with tourists. Usually countless Americans spend their vacation in the small city. During our visit we could hardly spot a tourist at all and the promenade and shops were empty. Therefore, the prices were cheaper than in San Juan or Ponce – actually a reason to fly over – and help people through your vacation: They need the money. Many of the beaches we wanted to visit were not accessible. Partially blocked by fallen trees, once the road was torn into the sea by the hurricane – on other beaches there were just too much branches and garbage and you could hardly relaxed. Otherwise, pictures say more than a thousand words, especially when it comes to sandy beaches, palm trees and the sea. As always, the gallery can be zoomed with the icons on the left side. The island offers uncountable attractions such as the “El Yunque National Park”. Usually you can explore the rain-forest through trails, but due to the hurricane, only one waterfall was accessible. The rest was said to be unsafe – after all, they had to clear the path and check some trees. A few weeks later we heard from other tourists that one path is passable. However, this only takes 15 minutes, as a collapsed bridge blocks the rest of the path. You still get a beautiful view from the road to the waterfall, which is worth the drive into the park – at least to me. We spent a lot of time simply exploring the island by car and found countless nice places. For example, the “Birth of a New World” statue, which represents Christopher Columbus in a size of a subtle 110 meters (360 feet). It was offered to some American cities such as Baltimore, Miami, New York and Fort Lauderdale, but no one wanted to set up the artwork. After all, it would ruin their skyline. After several years, the monument was finally built in Arecibo and is ever-since the tallest statue of the Hemisphere. In addition, we visited several lighthouses and tried to shop in outlet malls. Our first point of contact was the “Premium Outlet” on the north coast, but not even half of the shops were open. Additionally, the “Outlet Mall 66” was closed completely – both probably due to damage caused by the storm. Another special feature of the island are the three different “Bio-Bays”, of which only twelve exist worldwide. They got fluorescent microorganisms that cause the moving seawater to light up at night. It must be a wonderful spectacle, that slowly comes back after the hurricane. Unfortunately, we had no way of checking it out ourselves. Either the bay was still closed, full moon (you hardly see anything) or nobody answered our messages. The wildlife in Puerto Rico was greatly decimated by the hurricane. We have seen bats (the last native animals of the island), iguanas, geckos and various species of birds such as condors, gulls, pigeons and greater Antillean grackle (beautiful, pitch-black birds). Local people told us that in the past, they had often seen hummingbirds and parrots, but since the hurricane, they have simply vanished. Otherwise, we saw a turtle – dead, next to the highway. There are a lot of stray dogs and cats on the streets. Even in “El Yunque Park” we discovered two abandoned velvet paws. Most of the strays belonged to emigrants and were simply left to their fate after the hurricane. So you can often see dead dogs on the side of the road, more than I have ever seen in any other country – but according to Tes, it´s less than in Asia. I really enjoyed the seven weeks in the Caribbean. In my opinion, the climate is very pleasant and the nature and beaches simply top class. However, there still lies much work ahead of the island´s inhabitants. After all, there are still countless houses covered with the blue tarpaulins of the relief organizations, people without electricity or water and a lot more to do. For exactly these reasons, holidaymakers should consider the Caribbean island as a travel destination. The beaches are amazing, the food tastes very good and most people are friendly and accommodating – as long as they are not behind a steering wheel. At that time we had to decide between Peru, which was a bus trip from Ecuador or the Caribbean island. In retrospect, I’m glad we chose Puerto Rico. Seeing an island after such a misfortune is certainly not a privilege, but an experience that sticks with you. I intentionally did not put many photos of destruction in the galleries. With this post, I do not want to show the extent of the chaos, but the still existing beauty of the country. After Puerto Rico, we took a cruise to some islands in the eastern Caribbean: Posts about St. Thomas, Barbados, St. Lucia, Saint Kitts and St. Martin will be published soon. One thing up front: All of them are very beautiful – one of them got hit even harder by a hurricane – I have never seen anything like this.